We use 4 small nets and 2 regular sized nets in the hockey class I do. They are great as obstacles and goals for SAG's. I did a camp in Jihlava, Czech Republic and we used 4 nets for the drills and games with youth and U20 players. Full ice backchecking transition game. One zone 4 games at once. Face the puck, give a target, pass while skating, shoot while skating, follow shot for a rebound. A. 1 skate and pass across to 2. B. 2 pass to 3 at the far end. C. 3 skate and regroup with 2. D. 2 pass to 1 and 1-2 attack and shoot. E. Repeat the other way; 4 pass across to 3. F. 3 regroup with 5 at the far end. G. 5 pass to 3. H. 3 and 4 attack the opposite end. This is a really good drill and a coach could create many options using the same flow. Attacker battle to keep his stick free and defender keep the defensive side and tie up the stick when it is exposed. Attacker shoot and go for the rebound and defender keep the stick on the puck and box out after a shot. 1. One attacker and one defender in the slot. 2. Extra players on the side to keep the puck in and restrict the playing area. 3. Coach passes from the top of the circle. 4. Offensive player battle to keep his stick free and gain the offensive side and shoot. 5. Defender battle from the defensive side and box out the attacker with stick on the puck. 6. Coach pass a new puck when the a puck is out of play. 7. Compete 15-20 seconds and keep score. 8. Battle without taking penalties and stress good technique. Shoot while skating, head up, give a target, pass hard, lead the player. A. 1-2-3 skate around the top of the circle and shoot. B. 1-2-3 break down the ice for a pass from the oringinal corner. C. 4 pass to 1, 5 to 2, 6 to 3. D. 1-2-3 take shots at each end. * Option is to get a pass from the next player in line first. Here are eighty drills that start from the corners. Individual and Team Skill are practiced. B6 Passing, timing and shooting. C6 Situation drills 1-1, 2-1 etc. Attack with speed, pass to the D for a one time shot. Make the first play early on the attack. On a late trailer pass defender challenge the shooter. 1. Start with D in diagonal corners and F at the red lines. 2. D1 wheel from the corner and pass to F1-F2 and join the rush vs. D2. 3. D3 wheel from behind the net pass to F3-F4 and attack 3-1 vs. D2. * Continue this flow with F4 starting the next attack. Give a target, defense box out and take sticks in front, attackers screen and tip. Isolate a wide D on the attack. Attack with speed. Go hard to the net. 1. Coach 1 pass to D1 across to D2 who shoots. 2. F1-F2 swing into the zone from the neutral zone and get a pass from Coach 2. 3. F1-F2 attack vs. D1-D2 and battle until the whistle. 4. D2 and D4 follow to the point and get a pass from Coach 1, D to D and shoot. 5. F1-F2 battle D1-D2 in front as D3-D4 take a point shot. 6. F3-F4 swing down and get a pass from Coach 1 and attack 2-2 vs. D3-D4. Defender close the gap quickly. Stick on the puck, body on body, defensive side, box out in the slot, tie up stick. Attacker protect the puck, make a quick move and go to the net. Screen, tip. A. D1 start with a shot from the mid-point. B. Skate toward the corner and defend vs. F1 attacking the high slot. C. On whistle D1 defend F2 from the other corner attacking low from the hash. D. Next whistle D1 defend vs. F3 at the blue line in the wide lane . E. Fourth whistle F3 screen and D1 box out and D2 shoot from the point. F. D2 now defends 1-1 vs. F4-F5-F6. I took this video when various international U20 teams were practicing during the 2012 IIHF World U20 Championships in Calgary. Winsport has 4 rinks and there usually were 4 countries having practice at the same time. European teams use games to warm-up and to practice skills much more than we do in North America. 1. Game is in one zone and if the puck goes over the blue line the other team gets it. 2. Puck changes possession on a goal or a frozen puck. 3. Transition to offense by making at least one pass before you can shoot. 4. Use modified rules such as: one pass, two passes, only forehand, only backhand, goals only on one touch shots, two touch or two seconds with the puck, puck carrier must make an escape move, goals must originate from the point, goals must originate from below the goal line, only one pass allowed, only certain kinds of shots like a backhand or slap shot, etc..
5. Add intensity by keeping score and having tournaments. This is a great presentation put together by Rob Serviss. 1)The offence of transporting wool or sheep out of the kingdom contrary to the statute formerly existing. •Owls are active at dusk/dawn and quiet in daytime. •A group of owls is called a parliament.
? Beak is Sharp & Deadly! Great diagrams in the PDF. Practice all of the edges and the stride both forward and backward. Divide the ice into 4 lanes with a group going down and back on the outside and middle lane on each half. Introduce a new skill after each down and back. 1. Stride in an arc on the inside edges. 2. Cross-over with big strides on the outside edges. 3. Both legs at once on the inside edges and cross under to the outside edges. 4. Alternate sides with the heel to heel slide in an arc each way then add a stride. 5. Skate backward with a glide on the inside edges. 6. Backward step-over’s to the outside edges and glide. We did this game in practice last night and it created great low battles needing quick escape moves and the defenders learning how to see the puck and their check when the puck is low. It also created a lot of back door plays.This transferred to skills needed with the Spread PPlay using the two low attackers below the goal line. I saw this set up used while coaching in Austria and it is very hard to cover because backs tend to get turned and cross ice passes for one timers and back door walk-outs are very hard to handle for the pk. Jokers must learn to protect the puck and make plays on their own or passes. Everyone learns to play low in the zone on offense and defense. 1. Each team has two low jokers. 2. Jokers can check Jokers. 4. Jokers can skate out to the face-off lines. 5. Jokers must touch the puck to score. 6. Jokers rotate on their own. 7. Vary between 1 or 2 Jokers and 1 to 4 out players. A one timer power play. Players can rotate positions, walk our for back door plays, set pick and screens. 1. Set up with two players below the goal line and the high attackers just above the top of the circles. 2. Quick passes to make the defenders move. 3. Read when the defender has the 'Stare" looking low and find shooting seams. 4. Walk-out for back door plays to the other low player or a point man coming down. Practice various puck handling moves or skating skills. Add shots at the end of the lanes or obstacles to go around, under, over or through. Players who start at the inside lanes go. - inside to outside behind net to far outside and back inside and back to line. Players who start in outside lanes go. - outside to inside, behind net to inside the other way then far outside and back to line. * You can also make this into “Mission Impossible” where the players do tasks like skating through obstacles, they must score, jump over, slide under, stickhandle through a maze of pucks etc. If they fail they must go back to where they started and do it again. You give a time limit and half go and half are judges or the coaches can judge..
Minnesota Hockey has a great website for coaches with lots of videos and practice ideas. Everyone joins the attack. First player without the puck go to the net hard. Next two create a reverse triangle. 4th and 5th attacker join the rush. 1. Players line up on one side in the neutral zone. 2. Start with a forward passing back to a defenseman. 3. Forwards fill the three lanes. 4. Go D to D and pass up to the forwards. 5. Attack with all five players. 6. Next group of 5 repeat the other way when the rush crosses the blue line. For the coaches who come here for ideas and coach the higher levels I have made a folder in my Dropbox with advanced practice ideas from pro, international teams, U17 and up. It can be accessed at. I also have attached a picture and short bio of the staff I was lucky enough to coach with in Salzburg, Austria. We shared the same large coaching room where we had our own computers with the Steva program to break down the games for seven months. It also had a Red Bull fridge full of the product and Carpe Diem which is another drink they make that is incredibly refreshing but only available in Europe. We had lots of great discussions. I met Jursinov 15 years before with Juhani Wahlsten and we did some clinics together in Finland. I was his guest coach for a few practices with TPS, Tuku. He came one week a month to run skills practices and would get me to give him English lessons when he was there. Square to the passer and have the stick back and ready. Follow through at the target with the outside knee pointing at the target. 1. Shooters form a umbrella and one touch pass and shoot. 2. New puck when the puck goes out of the playing area, goal or frozen puck. 3. Rotate in and positions each new puck. Same as the 3-0 but now there is a defender. *Keep score team vs. team and goalie vs. shooter. This is a video link about how goals are scored today using NHL examples. http://player.theplatform.com/p/TZlbt/MSG-MEDIA-INTERNAL-ONLY/select/Nqth38Y07CYjL_VchqHCyBQav9KEo2Yj It really compliments the drills we did today. Protect the puck, use fakes, escape moves, change of direction, feints, shoot and pass quickly, triple threat position. 1. Nets at each end of the circle and players start from the side. 2. Coach shoot a puck in (or player pass to teammate on the whistle. *Option is to play form 1-1 to 3-3, i.e. 1-1, 2-1, 3-2, 3-3. In this video demo watch Red 53 Gaudreau and 63 Bennet, who have exceptional tight moves. #53 scores a few goals because he does things so quickly. I teach a school hockey class for the HC Skills program. The players come to COP which may be the best practice facility in the world. It is where Hockey Canada is based and has 3 practice rinks and one 4000 seat arena. They get 50 one hour ice times each school year. It costs them about $800 for the program which includes a bus taking them to practice and back to school. I have been doing it since returning from Austria. This year it is a very young group. Play games with modified rules to isolate skills. Use regular and small nets. 1. Stagger 5 big or small nets across from each other. 2. When everyone is playing the rule is they must bounce the puck off the far boards to go onto offense. 3. Also play with the attack-defend-pass- rest and the defense passes to players waiting at the far boards. * Change the rules, use different kinds of pucks and balls and play even and odd number situations. * D200 1 on 1 game, where a team mate waits for a pass to go on offense is a fantastic way to practice stick handling. The play offense-defense-pass-rest and then on offense again. Force the puck carrier up the boards by denying a pass back with the stick and approaching from behind toward the back shoulder. 1. Players start in a wide lane. 2. Coach pass the puck ahead and P1 skate for the puck while P2 tracks from behind. 3. P2 keeps steer P1 with his stick denying a pass back and approaches from slightly behind. 4. P2 angles P1 toward the boards and approaches at the back shoulder. 5. P2 rubs P1 out with the ‘stick on the puck and body on body’ skating through the arms with his inside leg in front. 6. P2 takes possession of the loose puck. * Option is for P2 to take a shot or progress to a battle drill where either P1 or P2 shoots. Video Demonstration of first a defensive angle check where the checker leads with the trailing leg and drives the lead leg between the legs of the attacker. In the offensive angle check the checker skates through the arms of the attacker and lead leg goes in front. One touch passes only. Give a target and be ready to pass and shoot. Slide into open lanes. 1. Four attackers set up in a box vs. two defenders. 2. Only one touch passes and one touch shots are allowed. 3. Move into open lanes for a pass. 4. Defenders keep sticks in the passing lanes and block shots. 5. Have a contest and keep score. *Progression is to start with two touch and progress to one touch passes. *Practice 4-0, 4-1 then 4-2. The major obstacle in most sports is that there is no consistent curriculum with a 'scope and sequence' to develop the skills, habits and game understanding to be effective players. 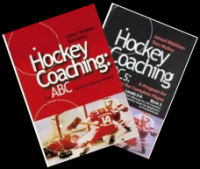 Juhani Wahlsten and I developed this sequential program (with lots of input from the great Russian coach Vladimir Jursinov and Finnish Olympic coach Erkka Westerlund) and put it together for the Austrian Hockey Association and as a supplement to the program in Finland. The idea of this site is to continually update the material as the game changes and new practice and team play ideas are developed. Below is the original program plus links to pdf's with hundreds of new drills, games and team play ideas from all over the hockey world. "The Game is the Greatest Coach"
The entire curriculum was developed with these two themes in the forefront. To supplement Level 0-1 these levels take drills and games coded: A1, A2, A200, B1, D2, D200, D3, D300, D4, D400, D5, D500, E1. From the Dropbox link below. To supplement Level 2 add drills and games coded: A2, A200, B2, B200, B3, B300, B4, D1, D100, D2, D200, D3, D300, D4, D400, E1, G.
To supplement Level Three use A2, A200, A3, A300, for review, B1, B2, B200, B3, B300, B4, B400, B5, B500, B6, B600, B7, C1, C2, C3 all of the D Games, E1 all of the shoot-outs, G.
Supplement Level 4 with A200, B3, B300, B4, B5, B500, B400, B6, B600, C2, C3, C6, C600, D1, D100, D2, D200, D4, D400, T1, T2, T3, T4, E1, F, G.
Levels 5-6 focus on transition, advanced drills and team play. All of the DT transition games, B6, B600, B200, B202, C6, C600, D100, T1, T2, T3, T4, T1-3, T2-4, E1, F, G, O. Additional drills and games and all of the T1-T2-T3-T4 drills and games are in the dropbox. As you move through the levels into the more difficult material the beginning levels are used for warm-up and review. Players must quickly transition between the 4 game playing roles. Role 2. Support puck carrier. Role 3. Check puck carrier. Role 4. Cover away from the puck. 1. Play 2 on 2 to focus on transition between the four game playing roles. 2. Extra players wait at the blue line or to create a tight area game at the top of the circles. 3. Attack and try to score. 4. On a goal, frozen puck or turn-over the defending team pass to waiting teammates. 5. New offensive players attack vs. the players who lost the puck on offense. 6. Players who passed now rest. * Keep score and have tournaments. * Any number from 1-1 to 5-5 can be used. * Move the waiting players to reduce or expand space. * Modified rules can be used to focus on individual or team skill. Passing is a critical part of the game. You need good technique and the player you are passing to must be ready and open for a pass. Here are 10 drills and games to make your players great passers. Coaches, the pdf. from each of these Forum links has the description, diagram and video link. If you like the drill you can save it as a pdf. You win and lose games based on how you handle 1 on 1 situations on both sides of the puck. These are drills and transition games that practice offensive and defensive 1 on 1 situations. More 1-1 drills, transition games and games from around the hockey world can be found at the link below. The individual defensive skill of angling Is the key to defensive zone coverage,makes the forecheck work and is the first part body checking.The links are to the forum posting where there is a description, diagam and video link and a pdf. with everything and the second one is the video link. I will continue with my New Years Lists. I am not getting any response from coaches but I am doing the lists to make it easier for me to find drills and games to plan my practices. The first link is the forum posting and the second link is a video demonstration. All times are GMT. The time is now 13:17PM.